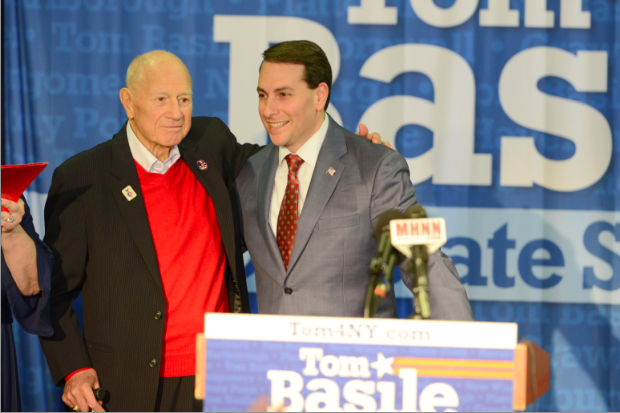 Newburgh – With Senator Bill Larkin by his side, Councilman Tom Basile on Saturday launched his campaign for the New York State Senate, promising to fight for taxpayers. “When I say ‘we’re all in this together,’ I mean it. As a husband and a father, a small-business owner and an elected official, I know how hard it is to make it in our area,” he told the audience. Basile’s previous government service includes the Administrations of Governor George Pataki and President George W. Bush, including as an advisor to the Coalition government in Baghdad, Iraq. Basile has owned his own business for more than a dozen years, is a published author, has taught at Fordham University, and was also managing director of a New York City-based public relations firm. Senator Bill Larkin gave Basile his endorsement during the campaign kickoff. Basile is a father of three and is serving his second term as Stony Point councilman.